Councils spend millions every year commissioning local services. Power to Change’s new research looks at government attempts to link local commissioning with greater social benefits – and recommends how weaknesses in the legislation might be resolved. What really makes a place tick? At first glance, the answer is simple enough. At the very least, communities will want to contribute to – and benefit from – a healthy local economy, one which offers quality jobs and decent training. (July’s Taylor Report is only the most recent paper to articulate this). And it needs to be a pleasant place to live, too, where people are friends with their neighbours, and know they can turn to them in times of need. This would certainly suggest – especially to our ears here at Power to Change – that there could be a prominent role for community businesses. Set up by local people to generate a profit, with a commitment to ploughing that profit into bringing additional social benefits to the area, community businesses already fulfil both sides of the equation. Thus when a community centre is run as a community business, it makes money from trading and provides services for everyone in the surrounding area. These businesses often collaborate with other institutions like schools or GP practices – such as New Wortley Community Centre, where a community-run centre is working with the local GP surgery, which refers patients to the centre for counselling and other support. Community businesses are ideally placed to deliver support to local public services, be paid for their time and effort, and re-invest that income back into the local community. 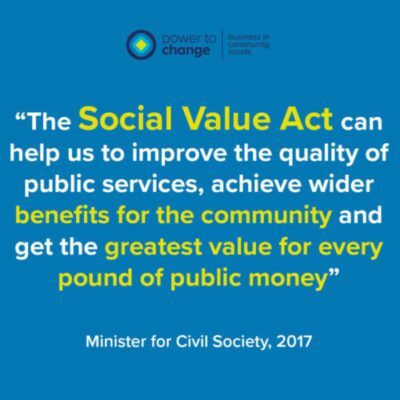 Today’s research looks at one of the relatively few levers available to central government to influence who is commissioned to deliver local services: 2012’s Social Value Act (SVA). Our new paper asks what community businesses have made of the SVA, and how the Act might be tweaked to make it more effective. 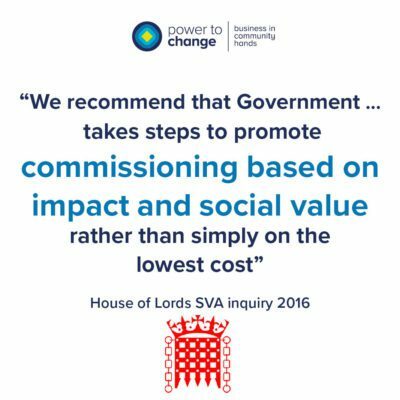 Put simply, the SVA requires local authorities to consider the social impact of their commissioning choices on contracts above a certain value (about £170,000), rather than simply rewarding the lowest bidders. The aim is to level the playing field, and enable providers – such as charities, social enterprises, or community businesses – who can deliver local growth and community good to compete with the big private companies. The government promised a review of the SVA back in February of this year, something derailed by the snap election (although government officials are confident that the review is on track for later this year). In the meantime, though, the House of Lords has weighed-in with their own concerns. The community businesses with whom we spoke were universally positive about the aims and principles of the SVA, but views on the Act itself was much more mixed. Some saw it as tokenistic, with little practical impact on how councils commissioned or from whom, but for some the commissioning landscape would be ‘much bleaker’ without the Act to nudge councils into considering social value. The SVA has done little if anything to influence community businesses in tendering for local contracts, however. Those which looked to work with local authorities said they would have done so whether the Act was there or not. Which invites the question of what we could do to make the SVA more relevant to more community businesses (and indeed other providers). The report rightly celebrates the collaborations and new relationships community businesses form in the interests of local people. Why would government policy not want to tap into this? Here is one place to start: when the government’s review is finally released, it should bring down that £170,000 threshold. Only a minority of community businesses operate at that scale, despite being committed to local networks, smart trading models and social good. A new threshold could bring them into play, possibly as prime providers or – more likely – as contracted partners to other, similar outfits. If central government is serious about using the policies it has to create better places, it doesn’t make much sense to freeze out community businesses. Lowering the threshold – along with some of our other recommendations to government – would usefully signal to community businesses that they are a part of national future plans.